The University Program Council at UL hosted their second trivia night. With February on it’s way out soon, their theme is Black History Month. Students’ knowledge was challenged on various black history topics such as famous actresses, inventors, and universities and more. 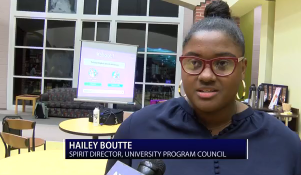 UPC Spirit Director Haley Boutee, says this event is geared towards educating and celebrating black culture. “Segment two of kind of the series. The first one we had was UL themed, and this one is black history themed, and the next one next month will be women’s’ history themed since it is women’s history month. But, the one tonight I think is super important because people at the university need to know about black history and know about other cultures since we are a PWI.